I like thinking about money. I enjoy creating spreadsheets and budgets. When the Sunday Seattle Times arrives, I almost always read the Business section first. Thinking and talking about money doesn’t bother me or cause me anxiety like lots of other people. Quite the contrary. The more I research, assess and understand my own personal finances, the more comfortable, safe and content I feel. So, when I heard there was a man living in the U.S. who quit money–just gave it up one day by putting his life savings of thirty dollars in a phone booth–I was very intrigued. When I started reading The Man Who Quit Money by Mark Sundeen, I thought, how can anyone live without money? What kind of crazy person would do that? 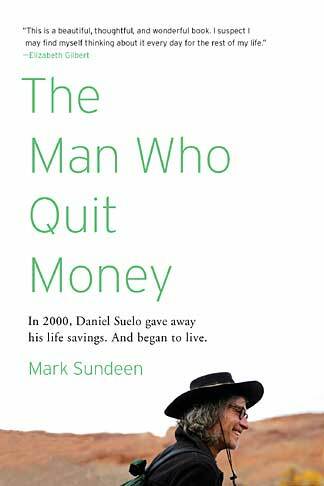 But the more I read, the more I could see why Daniel Suelo chose to quit money. Even though I could never imagine living the way Suelo does–not earning, receiving or paying a single cent–I could understand why he chose, and still chooses, to live this way. Reading this book made me wonder why I felt such a great need to save more and more money. Why was my sense of self and security so wrapped in how much savings I had? I started to question what is real security, separate from monetary means. Could I feel secure in myself no matter how much money I had? It’s a hard question for me to answer. I’m still grappling with it. This book is beautifully written and very thought-provoking. Sundeen did an excellent job profiling this most interesting and fascinating man. I suspect I will be thinking about Suelo’s story for many, many years to come. If you read it, please post what you thought of it. I’d love to hear your opinion. NOTE: The book link on this page is an affiliate link, so if you end up using it for your own online shopping, Super Frug will benefit (thank you!). This entry was posted in Finances, Super Frug Heroes by Peg. Bookmark the permalink.